I was curious whether Pete Kozma in 2013 had the poorest hitting performance by a Cardinals shortstop in the last 50 years. His season went downhill from there. During the Cardinals’ first road trip of the year, Tyson was assaulted and robbed in his hotel room. Kozma and Tyson have the poorest hitting statistics among Cardinals shortstops with at least 410 at-bats in a season in the last 50 years. Unlike Kozma, Tyson was a liability on defense. 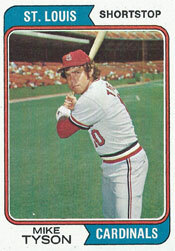 He committed 30 errors in 143 games at shortstop for the 1974 Cardinals. Kozma made nine errors in 139 games at shortstop for the 2013 Cardinals. Then there were those off-the-field problems for Tyson. Tyson also had a sore arm. On April 17, 1974, with the Cardinals in Philadelphia to play the Phillies, Tyson was in his room at the Bellevue-Stratford Hotel when he received a call from someone who identified himself as a maintenance man, asking whether the air-conditioning was working. Two men tied Tyson’s hands and taped his mouth, according to The Sporting News. They ransacked the room and fled with Tyson’s wallet, containing $80 in cash and two credit cards. Tyson managed to free himself and call police. Soon after, a suspect was arrested after trying to use one of the credit cards to buy clothes. Meanwhile, Tyson struggled on the field. He hit .200 (9-for-45) in May. By June, though, the Cardinals, “concerned about shortstop,” according to The Sporting News, made trade offers for shortstops Don Kessinger of the Cubs and Bud Harrelson of the Mets, but both proposals were rejected. Desperate, the Cardinals had coaches Vern Benson and George Kissell “hit ground balls by the bushel” to outfielder Luis Melendez each day in the hope of converting him into a shortstop, but that experiment was scratched. Instead, the Cardinals stayed with Tyson as their everyday shortstop. He hit .180 (11-for-61) in July. For the season, Tyson was especially inept against the Reds, hitting .065 (2-for-31) overall against them and going hitless (0-for-15) at Cincinnati’s Riverfront Stadium. He also batted . 111 (4-for-36) versus the Braves. After the season, the Cardinals acquired veteran Ed Brinkman from the Tigers and named him their starting shortstop for 1975, but Brinkman flopped and Tyson ended up playing more games at shortstop for the 1975 Cardinals than any other infielder. _ Dal Maxvill, 1967: 476 at-bats, 108 hits, 1 home run, .227 batting average and .297 on-base percentage. _ Brendan Ryan, 2010: 439 at-bats, 98 hits, 2 home runs, .223 batting average and .279 on-base percentage. Mike Tyson made an error in a game in ’75 on a routine DP to blow the 1st game i ever saw as a little kid at Busch. How anyone could peg him as a SS is hard to imagine. 2B maybe. Good point. Cardinals didn’t have a good succession plan for replacing Dal Maxvill.